Our range of products include Copper Items such as Copper Kamdhenu Cow, Copper Stone Dibbi With Plate, Copper Matka Set With Stone, Copper Glass & Jag With Plate, Cooper Jug Set, Copper Buddha and many more items. Special Kamdhenu Cow made of copper with different god statues. 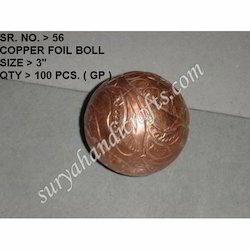 Copper Foil Ball offered comprises exclusively etched copper foil balls in size options of 3 inches. The exclusive surface etching work provided as well as use of quality shiny finish brass metal also helps in adding rich finish and high presentation values to these balls. These are best suited as hanging balls in interior spaces or to be kept on the mantle pieces so as to enhance the overall feel of the interior spaces. Some of its features include stylish finish appearance, choice of different size & finish choices, allows for unique look to the interiors among others.